Take one flower kit in our new colours and stack together in a pleasing way (trimming one of the circles). To sew together use one strand of your embroidery thread and long straight stitches (from the centre out). Sew through all the layers to make it nice and secure. Add a french knot right in the middle. 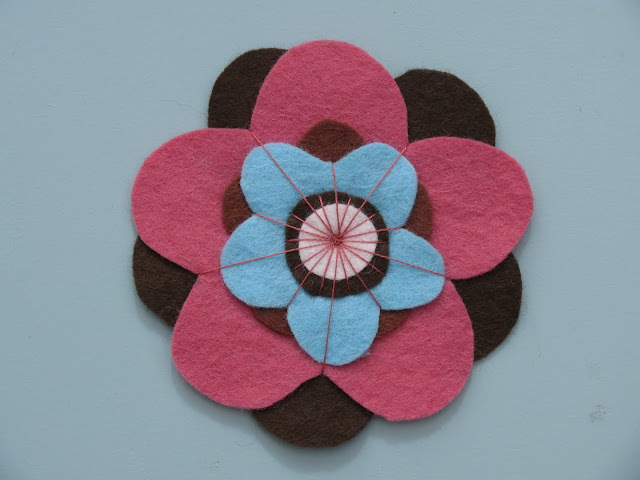 Our new colour Felt Flower kits will be on sale at Spring in The Loft @ Ardross Farm 23rd and 24th April and A Right Royal Pop-Up at Murray Library, Anstruther 28th April - 9th May. They are also at Harbour House, Elie too! Each unique kit includes 2 large and 2 small flower shapes, 2 circles, 2 colours of stranded thread, a selection of buttons and a brooch bar, AND a stitch guide! Check out some other designs here.